(Find me if you can!) What a great way to spend a vacation, cruising the Carribean and going to seminars with some great enthusiasts from the AVSForum and beyond. Plus you get to meet some industry leaders. (Some of which are a little snarky!) I won't be going this year, as the timing is bad for me, but i can highly recommend doing it at least once! When I initially installed my Acoupower subwoofers, I placed them in the center, behind the screen and sat the center channel on the top. I knew this probably wasn't optimal for coverage of multiple seating locations, but it was a start. Having two subwoofer cabinets, at least they were mutually coupled and I would not have any phasing issues with the collocation. I decided it was time to move them around and see how the response changes. At the moment I don't have any way to separately adjust the phase or delay of the two independently so I have to strictly rely on physical placement and luck. Before making any changes, I setup my measurement system, a Windows 7 notebook computer with Room EQ Wizard software, my EMU0404 sound interface, and Nady CM100 condenser mic at the main listening position. I also turned off Audyssey MultEQ processing from the Onkyo Pro 885 and disabled the Linkwitz Transform circuit (Marchand Bassis) so I have a native raw room response. I also turned off all the active monitors, so only the subwoofer was being measured. With the screen removed, here you can see the physical configuration of the LEFT, CENTER, RIGHT channels along with the Acoupower subwoofers in the center. As you can see, there isn't much room to jockey things around. The front wall is 12ft wide, however 2 ft of each corner starts a taper towards the wall due to triangular basstraps in each corner. The only solution was to place the LEFT and RIGHT monitors on top of the subwoofers as they were placed in the corners. This raised the tweeter level a little higher, which really isn't much of a problem, especially for my higher "second row seating". And here is the new corner loaded configuration. The CENTER channel stand isn't the ideal stand, but it was all I had for the moment. I was also able to rotate the center vertically, keeping the tweeter height the same as the LEFT and RIGHT. I also introduced a bit of toe in on the LEFT and RIGHT channels, another listening experiment I wanted to try. Now for the measurements...(click to enlarge) This was taken at the MLP (main listening position) amd shows how both configurations measure without moving the microphone. Interestingly, the response is all but identical from 15Hz to about 45Hz, with some deviation above that particularly around 90-100hz. 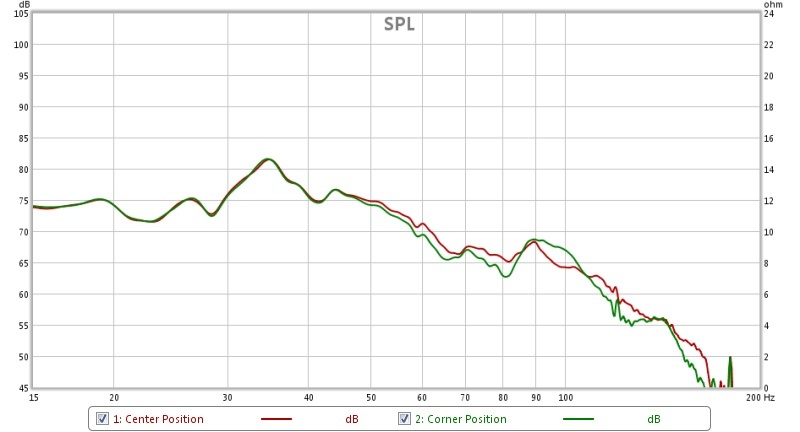 Keep in mind, this is with absolutely no equalization at all and no smoothing of the graph. I still get the room gain down low, which works well with the sealed subwoofers and the upper end rolls off because the crossover in the Onkyo 885 is still enabled. I really should have taken multiple position measurements before I began, and again afterwards. I'm going to have to save that for next time and just use my ears for now. I am happy that there weren't any major cancellations or deep notches in the new response. This is probably due to the fact that each subwoofer is still equidistant to the mic and adjacent walls. The fact that the response changed insignificantly under 45 Hz is great news for a future modification I've been thinking of. So what did I learn here? 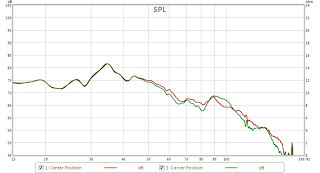 The original center position on the subwoofers seem to be smoother around the crossover frequencies, at least in the main listening position. More tests to come, as well as more changes!